Image Size: 18 X 25 in. The smallest sign could be read by these skilled Lakota hunters¯the turn of a leaf, sifted dirt, a pebble knocked out of place. Once found, a track needed to be interpreted¯direction of travel, speed, gait and other influences on their quarry’s path. Invisible to most people, this was the art of tracking. 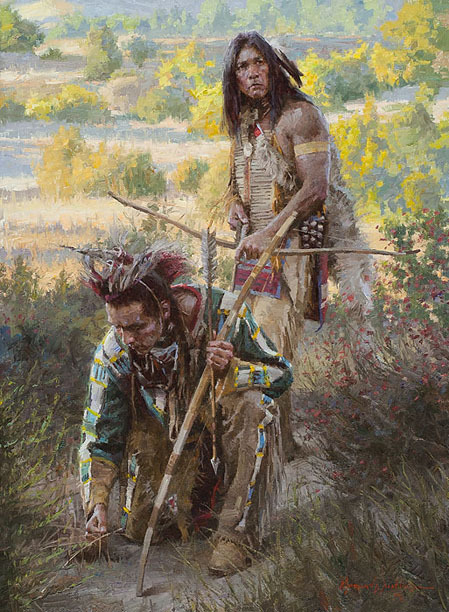 "The Trackers" is a companion work to Weistling’s "Lakota Hunters."